The people that run the PGA Merchandise Show are not merely content to fill a million square feet of exhibit space with hundreds of booths for three days at the Orange County Convention Center. They start the show with Demo Day before the Center even opens, using a 42-acre circular driving range in suburban Orlando. Both before and during the Show they also send credentialed media dozens of emails, hyping one thing or another. 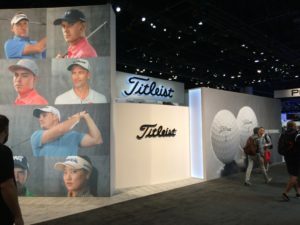 Titleist has one of the largest display areas at the PGA Merchandise Show in Orlando, FL. Given the company’s market share in many different parts of the golf business, that makes perfect sense. The extra push helped, at least when I saw an email that Titleist was using the Show to announce its new Tour Soft golf ball. When I read that the retail price for the new line was $34.99, my immediate reaction was that the NXT Tour balls I played for many years were now gone. The blast email convinced me to walk over to the massive Titleist spot on the convention floor. Jeff Flesner is the Director of National Accounts for Acushnet, the parent company for Titleist. He confirmed my first impression and then enthusiastically touted the new ball’s benefits. The former golf pro said, “This ball has the largest core and thinnest cover we’ve ever developed.” As we stood next to a tall display case, Flesner discussed the Tour Soft’s other features, including the grafted cover. That means the two pieces that make up a ball cover are interwoven instead of glued together. According to Titleist, the combination of the large core and the 342-dimple cover provides good distance and exceptional short game control. Considering that the term “generation” usually means about 20 years, he certainly made his point. I wonder when Titleist will take the same approach to their iconic Pro-V1 and Pro-V1X brands, which have also been on the market for a very long time. As with the NXT, the Tour Soft comes in white and high-optic yellow options. The balls should soon be available at all the usual sports outlets, including Cape Region pro shops. The United States Golf Association returns to historic Shinnecock Hills in Long Island this summer for the U.S. Open. I have fond memories of watching Corey Pavin hit a great 4-wood to the 18th green on Father’s Day to win the 1995 Open. The famous links layout did not host a playoff that year, because the other golfers faltered in trying to match Pavin’s performance. The most recent U.S. Open playoff featured Tiger Woods and Rocco Mediate in 2005 in an amazing test of endurance. That’s because Woods played that Open with a leg fracture, and somehow continued through the pain to earn a truly outstanding championship. The playoff was even more remarkable because under the USGA rules, an Open playoff required 18 more holes on the Monday after, with sudden death if the competitors remained tied after the full 90 holes. That’s what happened in 1994, when Ernie Els outlasted Colin Montgomerie and Loren Roberts at Oakmont. Montgomerie faltered early and Els won in sudden death against Roberts two holes after the regulation playoff 18 ended. For this year’s U.S. Open, there will no longer be the full 18-hole playoff on Monday. As announced Feb. 26, any required playoff will use a two-hole aggregate score system to determine the winners. If a tie remains after the 19th and 20th holes on Sunday, the match will go to sudden death. The two-hole format is a change from the prior three-hole system used for the USGA’s Women’s Open and Senior Open. It will also be an available option for the 2018 Women’s Senior Open, a first-time event this year. The USGA was the last major tournament sponsor to shorten the playoff format. It is a welcome change for the players, host clubs, broadcasters, sponsors, and especially the fans that come to watch these events. The British Open (or The Open, as they say across the pond) has used a four-hole playoff system for many years. Paul Lawrie won in 1999 in a playoff when Jean Van de Velde blew up a sure victory on his 72d hole at Carnoustie. The Masters Tournament has used a sudden death format for many years, with golfers as diverse as Sir Nick Faldo and Bubba Watson winning a green jacket in extra holes. The PGA Championship uses a three-hole aggregate score format for its playoffs, as in 2000 when Tiger Woods defeated a stubborn Bob May at Valhalla. The U.S. Open is already hard enough to win under normal circumstances. The USGA should be commended for making this long-sought change to its tournament structure.